Studio,with additional bedroom, full bath, sleeps 2 adults and 2 children. “A slice of Heaven in Paradise” is what you'll find at Open Palms Plantation. Relax and enjoy the peace and quite of not having neighbors close by. 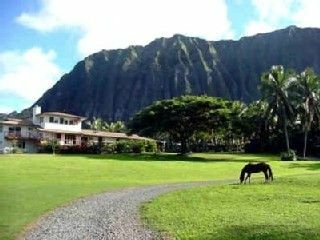 A beautiful island-style home nestled in Oahu's horse country on a 2 1/5 acre plantation setting located at the base of the spectacular Koolau mountain range and close to three of the worlds top rated beaches, Lanikai, Waimanalo and Kailua. We are just 3 minutes away from the 5-mile long pristine white sandy beach and turquoise water of Bellows and Waimanalo Beach. We are only 30 minutes from the Airport and Honolulu. Easy access to all of Oahu's sights and adventures without the hustle and bustle of a tourist area. Restaurants, shops and cinemas are just 5 minutes away in Kailua Town. Accommodations are a clean spacious high vaulted suite. It features split system air conditioning plus ceiling fans, and sleeps up to 2 adults and 2 child with all the amenities and comforts of home. Fully equipped Kitchen with Double Burner Cooktop large patio area with a gas B.B.Q.we have everything you will need for the beach, beach chairs, coolers, towels, beach mats, umbrellas and boogie boards. there is private parking by your front door. 'A slice of Heaven in Paradise' is what you'll find at Open Palms Plantation. Relax and enjoy the peace and quite of not having neighbors close by. A beautiful island-style home nestled in Oahu's horse country on a 2 1/5 acre plantation setting located at the base of the spectacular Koolau mountain range and close to three of the worlds top rated beaches, Lanikai, Waimanalo and Kailua. We are just 3 minutes away from the 5 mile long pristine white sandy beach and turquoise water of Bellows and Waimanalo Beach. We are only 25 minutes from the Airport and 30 minutes from Honolulu. Easy access to all of Oahu's sights and adventures without the hustle and bustle of a tourist area. Restaurants,shops and cinemas are just 10 minutes away in Kailua Town.